We often get asked, “Why is Farming a GPI Skill for Supports”? Gold generation although not as straightforward for a Support, is still very important. Support items are incredibly impactful so if you don’t get them as fast as the enemy Support, your team will be at a disadvantage. In this guest post by PicklePants, we cover the different ways in which a Support can earn more gold. If you’re not a Support main, we recommend still sticking around so you can help enable your Support or prevent an enemy Support from maximizing their income. It’s no secret that Supports earn the least gold in League of Legends and we’re frequently scraping the piggy bank to buy our items. We have all struggled to get enough gold for our Ardent Censer or our Locket in the past. This guide’s intention is to help you increase your gold efficiency and make you the richest Support on the Summoners Rift. While it may not seem obvious, there are actually a range of ways you can get yourself some extra gold and allow you to get your items slightly quicker. One of the most obvious ways for a Support to get gold is through kills and assists. Each kill and assist is worth a certain amount of gold and getting your hands on as many of these throughout the game is a great way of increasing and gaining a gold lead. Naturally, some champions are easier to get kills or assists with. A utility Support such as Janna or Nami will have an increased number of assists compared to a champion like Thresh or Braum. This is because of the champions kit and how they’re played. Unfortunately, it can depend heavily on the champion that you’re playing because not every champion is the same. As a Support, I’d generally avoid taking kills unless your ADC or fellow teammate is unable to kill them and secure it. There are many different ways you can get assists, and some are less kosher than others. You can find yourself picking up easy assists by slightly adapting your play style. If you haven’t already watched any of your previous games, I would suggest doing so. Not only will it allow you to improve as a player but it will also allow you to analyze games and team fights. We’ve all been in situations where we’ve missed out on what seemed to be easy assists and this section will help you out on grabbing those buggers. Every Support has multiple abilities and some have target abilities that can be used on allies. These come in many forms, such as Taric’s W or Janna’s E. Using theses abilities on your allies throughout the game is a requirement and you should try to use them on your friends more than yourself- after all, they are the true carries right? Using these abilities frequently on your allies will allow you to be granted assists if they kill somebody. Most assists will be granted in team fights where things can get pretty messy. Make sure to use your abilities and keep auto attacking anybody and everybody until you die or win the fight. It’s gonna be hectic but keep an eye out to shield and heal your allies as much as you can. This will not only grant them some crucial protection, but it will also grant you an assist if they kill somebody. The biggest thing to remember about abilities is that your Q, W and E all have shorter cooldowns compared to your Ultimate. You can, in some cases throw everything at the enemy including the kitchen sink to protect your team. Although this could be considered a waste of mana and abilities, as long as you are getting an assist out of it- then you should be fine. When possible, avoid using your Ultimate to get 1 assist. In some cases, you may need it, but for the most part – try to hold on to your Ultimate for another time when it can make a bigger impact. Example situation: If you are Soraka and have your Ultimate up, using your Ultimate to get one assist in the top lane could be considered a waste. This is because Soraka’s Ultimate has a long cooldown (160-130 sec) and is often game-changing – you do not want to be caught without it. Only use your Ultimate (in this situation) to save low health allies and not use it to greed for assists. Pro Tip: Instead of miss clicking and wasting your shield on the wrong ally, hover over your allied champions icon and press the ability. This is just as efficient as pressing the ability on the champion itself. This is also really good when you have a Shaco and are unsure on which one the real one is. This next tip is incredibly situational and isn’t always going to work, however it’s a good opportunity to look for. In the early game, you may find yourself in base at the same time as your Top laner or Mid laner. If they are in the base and are going to use their Teleport to lane, you should use your shield on them. In the unlikelihood that they kill an enemy champion- you’d be granted an assist. As we can see in this clip, this is a really cheesy way of getting assists, but League is all about the little thinngs. This can help you earn more gold and gain a lead because you would’ve got an assist out of it. So, when you’re next in base, use an ability on your teleporting ally for a chance of getting an assist! While we have talked mostly about getting kills and assists, there is another way to increase your gold income- and it starts at level 1. There are three types of Supports in League of Legends and each has a unique starting item that they can take. Relic Shield is a starting item that is usually taken by Tank Supports such as Thresh. Spellthief’s Edge is a starting item that is usually taken on champions who like to poke during the laning phase. The final starting item, Ancient Coin, is usually taken by champions who do not necessarily have the greatest of early games, nor do they have the possibility to consistently poke and out damage the enemy opponent. Taking the correct starting item is incredibly important, if you get this wrong, you could be forfeiting the lane to the enemy. As suggested, it is important to take the correct starting item. If you are unsure of what to take, then I would recommend searching for your favorite champion and looking up what they usually start. As a high ELO Support main, I usually look at who I am against and who I am with. For example, my favorite champion – Janna, can take two of the three starting Support items. Currently, Spell Thief’s is very strong on her. However, if I am in a matchup where I cannot poke the enemy or out trade them with my carry, then there would be no point taking it as I would be unable to stack it quickly. Coin would be the choice here. The main thing to remember is that this item will make you money. If you cannot abuse your item (for example, abused Spell Thief’s stacks) then you should not buy it – instead, go with Ancient Coin. Ancient Coin is a very good item and is very reliable. When taking this item, remember to poke and stay proactive. Positioning plays a huge part in the laning phase as a Support. You should stand in a more favorable position to allow yourself to stack your starting item efficiently. If you stand too far back, or you’re not being proactive with your item, then you will see yourself falling behind in kills and assists. If you want to find out more about positioning during the laning phase, check out this guide. While it’s not always recommended, you can use certain items to get more assists. Locket, Redemption, and some other activatable items can grant assists. If you’re in a team fight where your team only gets one kill, using a low cooldown item will grant you some gold. For example, pressing and using Locket’s active in a team fight will grant a shield for your team. Locket has a relatively short cooldown which makes this move less risky. Of course, this is situational and you should not just use your items unless it’s safe too. Experience plays a huge role to know when you can or cannot use an item to get an assist. Try your hardest to think about you’re doing before you do it! In League of Legends, there are plenty of times when your ADC has died,and you’re unable to do anything. If you are unable to roam, then you may want to consider holding the wave and just last hit the enemy minion. This will allow you to gain some gold, gain a CS lead over the enemy Support, and also give yourself some solo experience. Holding the minion wave is very situational and you can only do it at certain times of the game. Holding the minion wave, is usually done during the early stages where impeccable wave management is needed. Every situation is different, however, if you are unable to roam and help an ally out, then you could try and hold the wave. Holding a wave is pretty simple, all you need to do is last hit the enemy minions when they are about to die. I would avoid pushing the wave (in the early game) as this can result in leaving the minion wave in a terrible position for your ADC to return. Freezing (also known as holding) the wave has a range of benefits. Try your best to when possible, hold the wave and last hit minions. Please note: Holding in a minion wave as a Support, is highly situational. Do not try to hold a minion wave whilst you are on low health, if you are low on health, just Recall. You should also not put yourself behind when the enemy returns. Recall when you can. In this example clip, we can see that I am holding the wave for my ADC carry to return. This not only gives me a gold advantage, it also allows my ADC to pick up the remaining farm and farm safely until I return. Something that is common in high ELO is the first tower swap. As soon as you kill the first tower in the bottom lane, you can switch with your Top laner and go to the top lane to pressure the tower. Once both towers have been destroyed, you now have access to the Rift Herald, mid lane, and the Dragons. It’s important to open up the map because it gives not only you a gold advantage, but also helps your team overall. League of Legends has a snowball effect and if you can switch lanes after you’ve got first tower, this will allow you and your other laners to buy items more quickly. We’ve discussed what you can do to get more assists and earn more gold as the support throughout this guide and I hope that you have learnt some new information. There are plenty of other ways that you can earn gold. Here are some other ways you can earn more pocket money and buy some wards. In patch 8.7, minion value was adjusted. As a Relic Shield Support, you should take the Cannon minions. This is because they give the most gold and will allow you to get better value for your stacks. As a Relic Shield Support, take your first two stacks on the first minion wave. I would recommend that you auto and take the melee minions. Then on your 3rd minion wave, there will be a Cannon minion. You should take the Cannon minion on the 3rd minion wave. The gold value of minions goes as follows: Canon minions, Melee minions, Caster minions. You should auto attack and use your stacks in this order to get the most out of your Relic Shield. With changes to Sightstone, you no longer have to buy it. Instead, you need to earn a certain amount of gold through your starting item to unlock the wards. 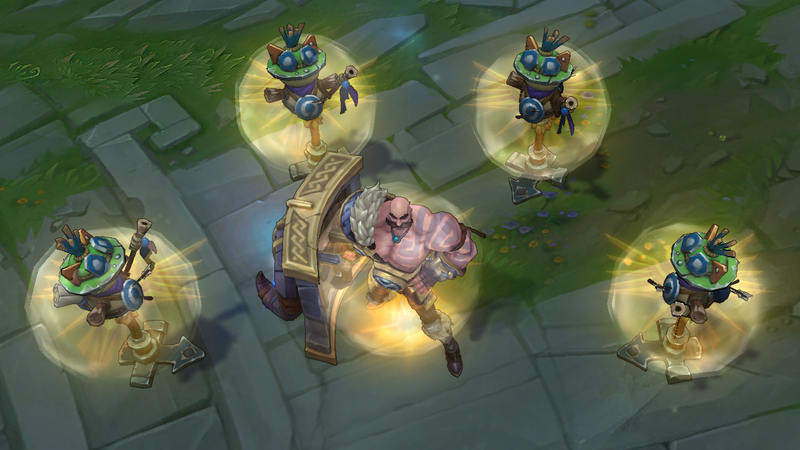 Make sure you get as many stacks as possible during the laning phase, and get your quest completed as soon as possible. Gold is incredibly important and you need to get as much of it as possible. Try to be proactive in lane, proactive in game and earn as much gold as you can. Thanks for reading! To discuss, or to find Picklepants, as always join us at our Discord community server.